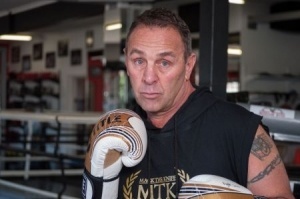 Born in the south of Johannesburg in 1961, Brian Mitchell is the only South African boxer to be inducted in the Hall of Fame in the US in 2009. He retired undefeated in 1995. He gave 25 years to the sport, 10 years in the amateur ranks and 15 as a professional. Brian Mitchell made his name boxing in the townships, Soweto, Springs, Sebokeng and Ekurhuleni beating the best black boxers of that era. Interestingly he never boxed against any white boxers. Brian Mitchell, known as the Raging Bull or Mean Machine, then won the WBA belt but was forced to defend it outside the country under trying circumstances. The WBA had suspended the SA’s membership because the then government’s Apartheid policies and the governing body’s world title fights could not be fought in the country. Brian Mitchell is revered as the greatest South African fighter of the 20th Century. Of his 47 professional fights, he won 43, drew three and lost one. He is a six-time recipient of the State President Sportsman of the Year Award and 12-times world champion. It is a motivational and moving stage biography of this legendary sportsman’s life, performed by the legend, Brian Mitchell, himself. It starts off asking the question: “What does it take to become a world champion boxer?” and ends by discovering what it takes to become a world class human being. It is inspirational, moving and funny and absolutely perfect for corporate South Africa. In Brian’s case, it is an astonishing story of rags to riches, a no holds barred, rollercoaster ride. The show is supported by 120 photos, music of the times and Brian even does a little fancy footwork. It is a production that will turn any conference into an event.